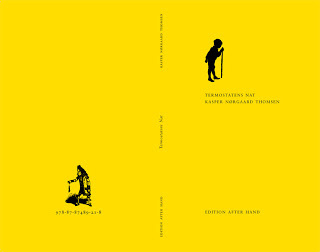 Termostatens Nat by Kaspar Nørgaard Thomsen (1972) was published in 2011 on Edition After Hand. Thomsen has previously written Baljen out on Arena/L&R, 2001; Malonecity 1 + 2 on Anblik, 2006; and Idioteque on Anblik, 2008. Termostatens Nat (TN) is a grotesque work of fiction about a murderer who has committed a massacre on Avernakø, an island in the Southern Funen Archipelago. My first thought while reading was whether it was invoking the massacre carried out by Anders Behring Breivik on Utøya in July 2011, but I did not find obvious references to the actual massacre. One not so obvious reference (since few would notice it) might be when the murderer in TN believes that his arm is not collaborative in carrying out the actions he intends to. When in court, Breivik proclaimed that his arm resisted to lift itself to fire the first shot. TN starts after the atrocities, where the murderer, as he is consistently named, has returned to the islands in the Southern Funen Archipelago in order to die. The murderer is interrupted from dying, however. Two brothers, by the name of store Ibsen and lille Ibsen, tell him that he is not allowed to die, seemingly because he is on their island. Annoyed, the murderer ends up killing them, though somewhat unwillingly. Briefly thereafter a boy descends from the clouds to tell the murderer that he cannot die because the boy has chosen him. The boy himself is a killer; he killed his parents and, as a consequence, he sits above the clouds. It turns out that the boy is the unborn baby of Tine Børing, the main character of Herman Bang’s Tine, who committed suicide while pregnant. Massakren tager form som en bølge: fra begyndelsen aner man ikke at den findes; så opdager man den, menneskene falder til jorden en efter en, og herefter er bølgen en del afverden. Bølgen tager form, den vokser: han træder op på den og skyller hen over disse mennesker. Bølgen er stor. Måske er han blevet større. Men menneskene er blevet små. Mordene fandt sted i det Sydfynske Øhav; han omtalte det såkaldte åsted som arkipelaget. Det er mere misvisende sådan, mere uvirkeligt. Det er tættere på bølgen. Meget mere følte han ikke. Han står stadig udenfor eller ved siden af dem som en statist, der er udsat for jordens overflade. Men drengen sidder roligt på en vældig sky, ser ned på morderen uden at gøre yderligere væsen af sig, og da morderen ikke er I stand til at foretage sig noget, slipper drengen taget om skyen, daler ned foran den forbløffede mand. Og den forbløffede kan ikke tro sine egne øjne. Du må dø, udbryder han. Men drengen svarer ham: du kan ikke dø nu – for jeg har valgt dig! Throughout the book there is a sense that anything can happen. Maybe this sense stems from the fact that times and realities are fused together. Several time dimensions overlap, reflections on contemporary popular culture is made by people supposedly present in the mid 19th century. Another reason for this sense of indeterminacy throughout the book is that much of what happens does not contribute to the development of the characters. In the average chronological conventional story the main character encounters difficulties and learns from these encounters. We tend to have expectations to such stories. However, in TN the main characters do not learn from their experiences, and maybe just therefore there is a sense of openness to reading the book. Almost as if a computer program had arbitrarily determined the next turn of events. Or as if the story had been determined by the means available, like when one cuts out pieces of a magazine in order to make a collage. In a short note following the main text Thomsen writes that TN borrows from the books Slagtebænk Dybbøl and Dommedag Als by Tom Buk-Swienty about the war in 1864, and Tine by Herman Bang, Porcile by Pier Paolo Pasolini, and Frederich Nietzsche’s Also Sprach Zarathustra, and the thoughts of George Bataille. It is not clear why Thomsen felt inclined to add this note, since most if not all literature is inspired or, more tacitly, influenced by previous works. However, it is obvious that certain passages of TN are written ‘on top of’ some of these other works, and that some sentences are direct quotations. One example is on the island Als, when the murderer arrives at an abandoned school whose children have left for Alsion (Alsion is a multi complex on Als finished in 2007 that houses a university campus, a cultural venue and several businesses) and while talking to the caretaker Leimand, is approached by Tine Børing, the little girl from Atzerballige. Tine Børing is the main character of Bang’s Tine who grew up in Asserballe. Asserballe is also mentioned by its ‘real name’ several places in TN, and similarly to later the murderer and the boy meet Sarathustra (who one place is spelled with the ‘real name’ Zarathustra). The mixed realities, times, and references to other literature makes TN an interesting object of study. One could easily spend a day reading through Bang’s Tine and TN and another day reading sporadically in the works of Bataille and TN. Or Also Sprach Zarathustra and TN. Consequently Thomsen’s book is one of those books where the pleasure you harvest from reading it is partly dependent on one’s knowledge of other literature. In this way Termostatens Nat nicely expresses a trend in contemporary art, namely that the artwork makes use of other works of art to create something irreducible new. The general method is as such nothing new, but whereas an immanent melancholia infused much post-modern art and intertextual literature in the 80’s and 90’s, motivated by a sense of loss of reference and connection to reality, more recent art has accepted that artworks in themselves can be expressions tout court and aren’t in essence burdened by a reference to reality. In good contemporary art that makes use of other art works to create something new, there is no longing for a steady reality. Rather, art is shown to be expressive in itself and therefore constitutive of reality itself. These recent works of art use other artworks exactly like the painter uses paint to paint his images. Other art becomes material for new art, material with definite properties. One example of this is seen when Tine is introduced in TN and the text suddenly overflows with eroticism, but this is obvious, since Tine was groundbreaking for portraying female desire.